Lisa Rinna has had a very successful Hollywood career which she credits, in part, to her large, Augmented Lips. When it comes to a beautiful face, the lips are second only to the eyes. Subconsciously, we associate fuller lips with youth and fertility. Larger lips are a big contributor to the “glow” of a pregnant woman’s face. As we age, so do our lips, and gradually they become thinner and thinner. Lip augmentation can be an integral part of facial rejuvenation. Lisa Rinna is putting her lip troubles behind her. Lucky for Lisa, her lips still look fine. Twenty-five years ago, the risks of silicone injections were not as clear cut, and the only approved injectable was Collagen, which was hard and completely gone in a month or two. Today, we have much better alternatives. Lip Augmentation can be performed with injectable HA’s like Restylane and Juvederm in a few minutes in the office. The results do need to be maintained; however, the results are full and soft, something that has not been possible previously without surgery. How long the results last is variable. Average results are 4-6 months and if you decide you not longer need it, after the plateau phase, the lips gradually return to their original size. Since lips thin as we age, there are no Permanent Lip Fillers. Even the perfectly sized lips will need a little maintenance to counteract the normal aging process. Inserting permanent fillers, like silicone, promotes the formation of chronic scars and foreign body reactions like granulomas. HA fillers are made from Hyaluronic Acid (HA), a normal component of skin and joints. Unlike free silicone injections, our bodies recognize HA as a normal component of the skin, and we have natural hyaluronidase, an enzyme that can clean up HA. 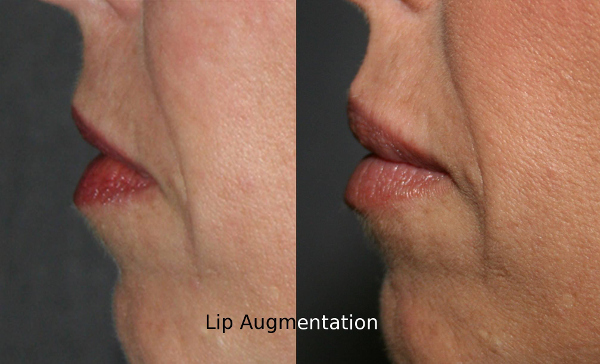 Lip Augmentation Before and After Photos: Lip enhancement performed with HA filler. If you are considering Lip Augmentation, especially if it is your first time, consider a brand name HA filler like Restylane or Juvederm. They can give a soft natural result, which is easy to maintain. Swelling is minimal, and with ice and elevation, the appearance is normal in 24-48 hours. Longer lasting alternatives are available, but they require a longer recovery, and are best when the goal size is well known.